China has instituted a city-wide Beijing ban on luxury advertising in a bid to reduce reminders of the widening income gap between the country’s burgeoning rich and the downtrodden poor. Companies face a 30,000 yuan (approx USD 4,800) fine should they fall foul of the rules around luxury advertising on TV, radio and other mass media including billboards. Words like “luxury”, “royal”, “supreme” and “high class” are to be removed from these ads. Watches entered the Chinese zeitgeist as the premier luxury gifts after a blogger posted pictures of China’s new railways minister Sheng Guangzu photographed with luxury watches from various brands. These watches commonly cost half the annual salary of top ministers. Senior officials earn anywhere from USD15,000 to USD20,000 per annum. Sheng replaced the former railways minister Liu Zhijun who was arrested for corruption for close to USD148 million in bribes. The ban for this type of advertising comes as China’s president-in-waiting Xi Jinping pushes his long term plan in the fight against graft. While the new regulations surrounding the new city ordinance are economic (in terms of perception of the Gini coefficient), there is a cultural component as well as more wealthy Chinese aspire to “foreign” brands like German made cars and drinking French wine and the Beijing Administration for Industry and Commerce has said that the new adverts should also not encourage the Chinese to aspire to the “western” way of life. Internet advertising was not included in the regulations, it remains to be seen if it was an oversight or intentional by local authorities. By 2015, China will account for over 20 percent (or USD$27 billion) of the global luxury market. According to 2010 figures, watches and bags are the fastest growing luxury segment. 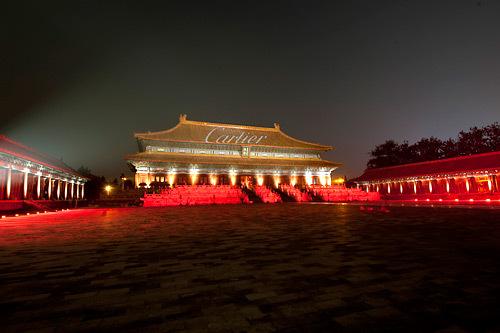 In China, Rolex, Omega and Cartier are the three most prestigious brands.